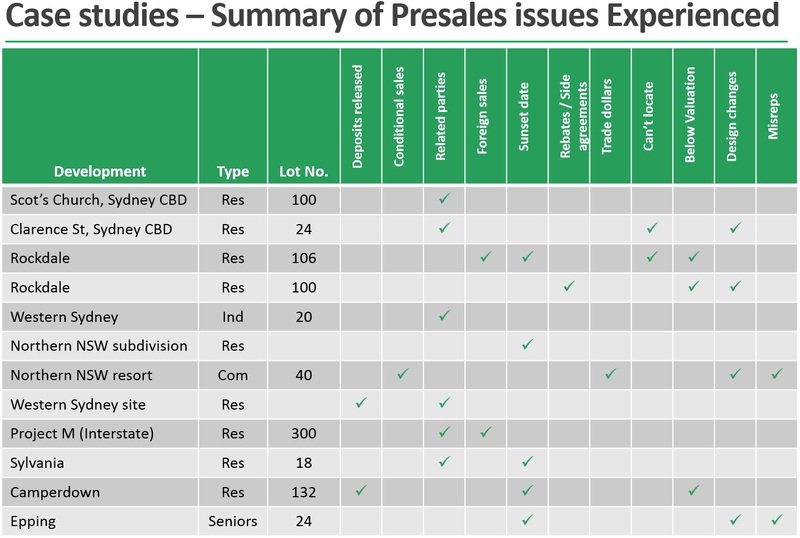 This is the first in a 4-part series of articles on pre-sales in the residential property development sector in Australia. as expert witnesses on litigated matters concerning property developments where pre-sales featured. When the members of our team first became involved in lending for property development, pre-sales were uncommon. 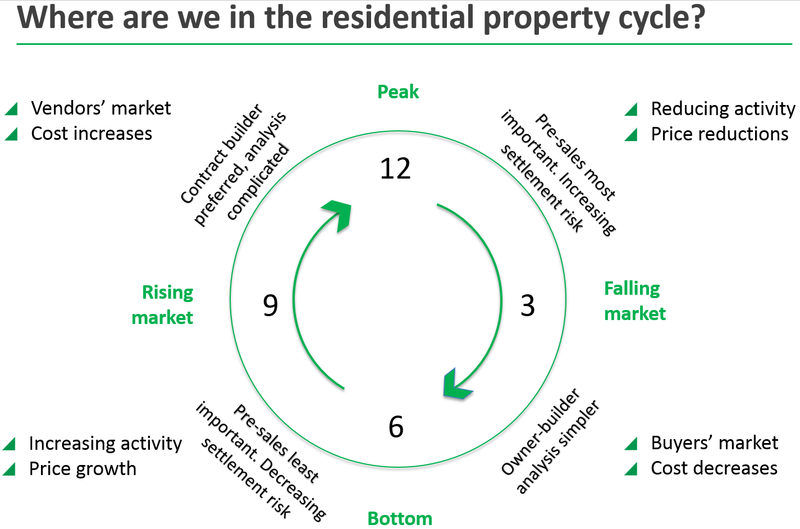 Most residential developments were small in comparison to the current property market cycle. ‘Large’ projects were often staged to mitigate sales risk. At that time, a project with 50 units was considered large. In the run-up to the GFC, pre-sales had become commonplace. Typically, lenders would require 30% of the stock in a development to be pre-sold. This would provide pre-sales cover of 50% or so of a lender’s debt, where borrowings amounted to approximately 80% of the total development cost. A ‘large’ development would comprise around 100 units. To achieve the required 30% pre-sales, might take a couple of months. The analysis undertaken by lenders was straightforward and manageable due to the size of the developments and generally the local domicile of buyers. Today, developments often contain 200 or more lots and lenders ask for pre-sale coverage of 100% of the debt. This means around 130 pre-sold units are required to activate construction finance. Since 2013, the Australian east coast property market has boomed, and developers have achieved these pre-sales at an unprecedented rate. In some cases, developers have even sold out entire projects in a single weekend. Lenders need to undertake a more thorough analysis of each project, which can be complicated and is time consuming. The reasons pre-sales appeal to both the lender and the developer are clear. To begin with, pre-sales ‘prove-up’ a development, establishing that buyers actually want the product on offer. Pre-sales support the developer’s applications for finance, and are now a requirement for almost all Bank development loan approvals. Pre-sales reduce the risk for both the lender and the developer, provided they remain in place. The pre-sales form part of the lender’s security (even though borrowers may sometimes think otherwise). They are particularly important in a flat or declining market. During the Global Financial Crisis, pre-sale settlement rates in metropolitan Sydney continued to be strong. In areas outside Sydney, settlement rates were much weaker. Other areas, such as coastal NSW, saw very poor settlement rates. Offering undisclosed incentives (such as contract cash or goods rebates) to achieve the required pre-sales. This would maintain ‘headline’ prices and support bank security valuations. However, this distorts market values and potentially the balance of the bank’s unsold stock. Contracting related-party sales (such as sales to family and friends), which are cancelled before settlement in the hope that they will be replaced with arms-length sales. Convincing purchasers to release deposits (for cashflow). Failing to extend sunset clauses or rescinding sales to capitalise on market price rises. Recent changes in NSW and other states consumer laws seek to offer additional protection against this practise. Off-set arrangements with development sub-contractors and suppliers, which hides the true value of the construction cost and potentially minimises or defers state and federal taxes. Deferring stock revaluation (in a declining market). Part 2, ‘The pitfalls and risks of pre-sales in residential property development’, provides a discussion of some of the pitfalls and risks inherent in pre-sales and suggests some steps that lenders can take to mitigate risk. Part 3, ‘Risks grow as property developments grow’, details the process lenders undertake, or at least should always undertake, to analyse and manage the risks of pre-sales. Part 4, ‘Residential property development – where to from here?’, conveys our perspective and opinions on the outlook for the residential real estate industry.